One advantage of having your workshop in the country is that land is plentiful. This spring, we’ve decided to put in a small garden for our apartment dwelling employees. We are going organic. The plot hasn’t been tilled for eight years, and before that it was a horse pasture, so the soil is herbicide and pesticide free. The first task was to till up the grass near an outside faucet. 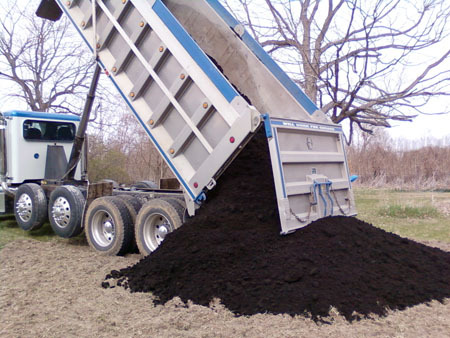 To improve the soil, we had some organic, compost soil hauled in from Soilmaker.com. Yes, the soil really is that black! We’ll use any unplanted garden space to grow some give-away veggies like heirloom Brandywine tomatoes. Cucumbers and squash are a big favorite around here. Also on the short-list are hot peppers for making hot sauce, and cabbage for authentic fermented sauerkraut. We might even start some perennials like asparagus and rhubarb, too.